Teen Amateur Of The Week: Josh Bought Into Big Lifting! Josh initially lifted to win a state championship in football but turned into a full-time bodybuilder. See how he programs his life around hard training and clean eating! I looked up to my muscular dad who always tried to get my three older brothers and I to work out with him, but it never interested us. I was a heavyset kid in elementary school but rode my bike constantly to hang out with friends. As time progressed, I lost weight and was more fit than ever going into middle school. After school, I went home and lifted with my dad in a weight room that was attached to our house. My dad is extremely hardheaded. You either do things his way or no way at all. Shortly after I started lifting with him, I branched off and did my own thing. As I grew older, I saw more changes in my body and lifting became an obsession. I never missed workouts and loved everything about it, but nutrition never mattered. I played linebacker for my high school football team as a junior and made it to the first round of the playoffs. My graduating class was determined to make our senior year the best in school history. During the entire summer before my senior year, I pushed myself in the weight room and started taking nutrition seriously. We lost in the third round of the playoffs to the eventual state champions and I had the best season of my life. After the season, everyone looked into college football, but football wasn&apos;t my passion; bodybuilding was. I continued lifting and started watching lots of NPC and IFBB videos, which really interested me. While everyone from my football team was looking for colleges to attend for football, I was looking for shows to compete in for bodybuilding. From there, I found a show and began to prep for it. "While everyone from my football team was looking for colleges to attend for football, I was looking for shows to compete in for bodybuilding." I do 40 minutes of low-intensity fasted cardio every morning. "Get comfortable with being uncomfortable." I wanted to take myself to the next level. Lifting weights and eating right wasn&apos;t enough for me. I wanted to take my diet, training, and ability to motivate others to the next level by any means necessary. I&apos;m love competing against myself. Fitness and healthy living are my passion. What or who motivated you? One of my main motivations is proving everyone wrong who said I wouldn&apos;t amount to anything and made fun of my passion for fitness. On days when I didn&apos;t feel motivated, I watched motivational videos on YouTube and looked at my progress pictures to keep my goals and dreams in front of me at all times. I want to become an IFBB men&apos;s physique pro and hope to get clothing and supplement sponsorships. If you train your mind, your body will follow. Never let anyone tell you that you can&apos;t do something; if you have a dream go after it. Anything is possible. Push yourself and make it happen. Get comfortable with being uncomfortable. IFBB men&apos;s physique pro, Michael Anderson, is an amazing representative of the IFBB and men&apos;s physique. I love that he makes time for his fans. I had the honor of being back stage at my first competition where Michael was also competing at the pro show and he was amazing. 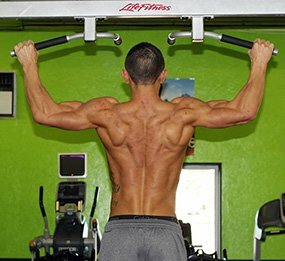 Bodybuilding.com helped me reach my goals by providing success stories. The stories showed me that anything is possible. The contests on Bodybuilding.com pushed me after I applied, and I constantly thrived.